Posted on 7, March 2016 by EuropaWire PR Editors | This entry was posted in Apparel, Fashion & Beauty, Automotive, Retail, United Kingdom and tagged Bentley, Infinite Rush, new fragrance. Bookmark the permalink. CREWE, 07-Mar-2016 — /EuropaWire/ — Capturing the legendary luxury and extraordinary performance of Bentley’s new SUV, the new fragrance Infinite Rush embodies the spirit of the modern adventurer and is dedicated to those who consistently push themselves to the limit. Just as the new Bentley Bentayga takes luxury to new heights, with no limits to its exceptional performance on and off the road, so Infinite Rush appeals to the man who enjoys sensational experiences. Calm and confident, he regularly explores new horizons, captivated by extreme scenarios such as driving the Bentayga through sand dunes in the desert, or jumping from a helicopter into the sea. Always intent on getting the most out of life, going further while staying focused, he remains relaxed and ready for the next challenge. He cultivates curiosity, surprising himself and never choosing the easy option. The Infinite Rush fragrance has been created in his image, with a breathtaking, spicy freshness and a warm, woody base heralding the strong sensuality of this active modern man. Bentley Infinite Rush eau de toilette’s modernity lies in the exceptional quality of its raw materials, which combine and exude true luxury. The freshness from the top notes evokes a rush of adrenaline, followed by a cocktail of spices to electrify the senses. Stirring woody base notes conjure up Bentley’s characteristic universe of luxury, refinement and warmth. Top notes: an explosion of pink peppercorns bursting into sparkling mandarin, encapsulating man’s energy. An aromatic, tonic touch of rosemary evokes masculinity. The heart soon tips towards the intriguing elemi, a complex resin fluctuating between lemon, fennel, pepper and incense. This balm is surrounded by potent wood, which builds the mood: elegant, husky smoked vetiver, and ever chic cedar. The base of amber wood serves to amplify the spicy notes, while musk helps this woody symphony, swathed in tree moss for a hint of mystery, to last longer on the skin. By turns fresh, spicy and deeply woody, the fragrance embodies every aspect of the Infinite Rush man: enthusiastic and active, but also confident, educated, and a thrill-seeker. Bentley Infinite Rush shares the same design language of shapes and curves as Bentley models. Both the cap and the bottle’s wide shoulders are adorned with silver metal. A sophisticated final touch is Bentley’s signature knurling on the base of the stopper. Bentley Infinite Rush goes even further by completing its premium glass with a high-tech crackled effect, an innovation on a fragrance bottle. A special layer of varnish is applied on top of a classic varnish, and retracts in a haphazard manner on contact and during firing. In this way, no two bottles are the same, with each sporting an individual mosaic. This peeling paint effect symbolises untamed nature and the arid earth that the Infinite Rush adventurer will travel across on his exploits. These embossed effects produce an intense tactile sensation when held in the hand. Equally important thanks to the transparent glass, the eau de toilette can be viewed as if through the cracks of the parched ground. Bentley’s legendary winged B is affixed to the centre of the bottle. An embossed metal plaque contributes to its luxurious feel. The box echoes the Bentley Infinite Rush bottle, with a band of knurling on the top and the winged initial B affixed to a two-tone box combining satin silver and a cracked motif. 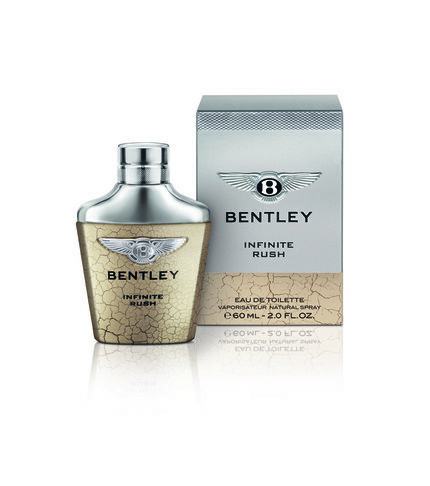 The new Bentley Infinite Rush line will be available in selected international perfumeries and department stores from April 2016. Harrods’ exclusivity from March 8 to 22, 2016. Bentley Motors is the most sought after luxury car brand in the world. The company’s headquarters in Crewe is home to all of its operations including design, R&D, engineering and production of the company’s three model lines, Continental, Flying Spur, Bentayga and Mulsanne. The combination of fine craftsmanship, using skills that have been handed down through generations, alongside engineering expertise and cutting-edge technology is unique to UK luxury car brands such as Bentley. It is also an example of high-value British manufacturing at its best. Bentley employs around 4,000 people at Crewe.